These pictures were taken a couple of days ago - and we found 7 eggs on their nest this morning! Leabank Square Swans Expect Triplets!! Well a couple of them have decided to make our reedbeds a home. This beautiful twosome have made a huge nest on the floating island - and the penn has now laid 3 eggs. Dad is fiercly patrolling up & down to make sure that no-one gets too close to their nest. He is having a bit of a rough time with the rowers from the clubs on both sides - and was actually clipped on Sunday. If you're up on the riverbank while they're rowing past - please give them the heads up about the nest - especially when the cygnets arrive. Also - please don't go too close to the nest - remember swans are protected species - and as such - it's illegal to interfere with them. But please enjoy this stunning spectacle of nature being played out right on our own doorstep. It all goes to show that if you create a more diverse environment - nature comes to you! I know! Same old same old. Look at this pathetic sound barrier meant to shield Leabank Square from the demolition of the concrete from the old welfare centre. One resident describes it as a fig leaf, another as a cricket white board (no - me neither), and many other descriptions that I can't post up here. However you describe it - it doesn't actually work. They're taking the massive concrete blocks - and jack-hammering them into smaller pieces for the wall - with a pair massive diggers. The noise is absolutely thunderous! Not only is it coming straight over - but we're lucky to get the echo of it bouncing off the hideous media centre as well. But the worst thing about it all - is that they haven't even attempted to suppress any of Arena Fields with any water at all. We are all swallowing mouthfuls of dust, concrete dust, sand - and whatever contaminates there are taking off from their site! I know we've been here many times before - but doesn't this just go to show just how arrogantly insignificant the ODA considers its neighbours? A pathetic tiny screen to shield us from any noise - and no water suppression. It's only those oiks over in Hackney Wick - why even bother?! Not just content with waking up Leabank Square residents every Saturday morning - our overly friendly Jehovah's Witnesses are now patrolling the Towpath opposite Leabank Square! Looks like the Olympic vigilantes have got allies helping them out all along the canal nowdays. Some cyclists & joggers were telling them where to get off - but a few dog walkers were being friended-up by the Witnesses. 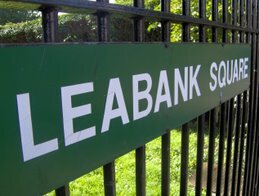 This posting also serves as a gentle reminder to all Leabank Square block residents not to just buzz anyone into the blocks - especially on Saturday mornings. Besides the obvious security risks - the Witnesses are really becoming an incredible nuisance along the corridors. Oh yes! And when you rip the Watchtower up in their faces - please pick up the pieces after they've left.